If there's one ingredient I can transform from "blah..." to "bam! ", it would be rice. I credit the fact that I grew up eating rice three times a day and sometimes, for snacks in between meals. It wasn't just considered a side dish or starch to our meals, but rice was used in some form in appetizers, entrees and even desserts! So if anyone knows anything about working with rice, I proudly raise my hand. By far, my favorite use for rice is involving leftovers. 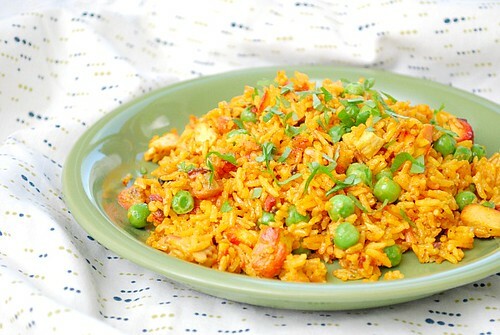 I transformed some Indian leftovers into this comforting, one pot dish - Chicken Tikka Masala Rice. Tender and flavorful chicken simmered in a spicy Tikka Masala sauce is tossed with garlic fried rice. So why the love of leftover rice? It's because any leftovers usually found their way into garlic fried rice. The same still stands true in my own kitchen today. So when I had leftover rice waiting to be used... and I had leftover Chicken Tikka Masala from a previous dinner, it seemed like combining the two would be a delicious idea... and a delicious idea it was! I love how the chicken tikka masala flavor had intensified slightly with leftovers. The toasted rice complimented the flavors of the chicken tikka masala, making for a comforting dish! In a large skillet over medium high heat, add oil and saute garlic and onion until softened. Add rice along with the spices to your taste preferences and cook until rice is slightly toasted. Chop up any large pieces of chicken in the tikka masala. Add the leftover chicken tikka masala to the skillet with the rice and fold in to thoroughly combine. Add the frozen peas and allow to heat the dish up. Garnish with chopped cilantro and serve. sounds so delicious! i love a good indian dish! I'm so glad I can come to you for rice dressing upping. lol (yup, made up that phrase) ;) Sounds wonderful! My mom has been telling me for years that I would like Chicken Tikka Masala, I don't know why I haven't tried it. I think I'll add it to my menu plan and maybe make this rice too!